Launched in the 1980s, the Lone Wolf series of gamebooks (not be confused with the Lone Wolf and Cub series of hella-awesome) quickly became firm favourites among a growing fan based. Alone among the gamebooks of their day, Lone Wolf was the first to feature an extended campaign in which your character could grow and expand as he travelled through all twenty-eight books of the original series. Now, you can return to the world of Magnamund, this time with your friends. 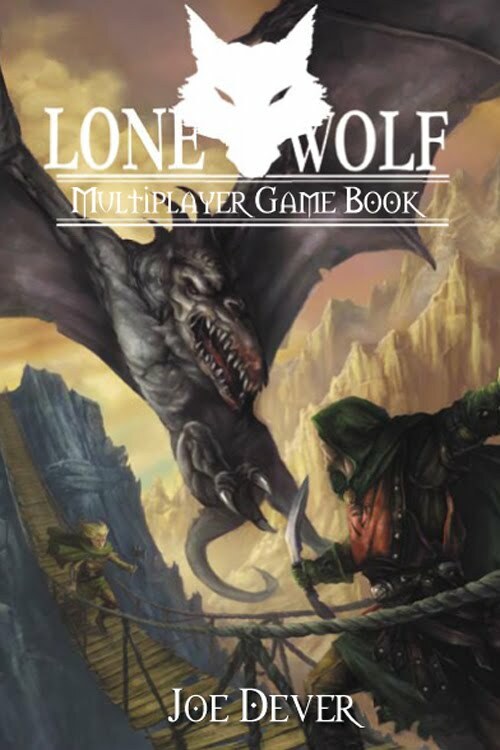 The Lone Wolf Multiplayer Gamebook is a full role-playing game, based on the simple rules system of the solo books. This first book in the series introduces character classes, basic rules, and three short introductory scenarios (linked as a short campaign). If the Lone Wolf Multiplayer Gamebook is one thing, it’s “simple”. The combat system is light and abstracted, there are very few statistics to keep track of, and character generation is a doddle. If you’re looking for your first RPG and have fond memories of the gamebooks on which it is based, then you could do a lot worse than pick this up for the price of a night out. Of course, chances are that if you do fondly remember the gamebooks, then you’ve probably either moved away from unplugged gaming entirely, or have moved on to bigger and more complex systems. After anything more complicated than this (and I would class Advanced Fighting Fantasy as being heavier than Lone Wolf Multiplayer), chances are you’re going to find this rather insipid. The presentation is fair to middling. The layout is clear and the illustrations are excellent, but so much has obviously been rather lazily cut and pasted from the original gamebooks, and it’s not even been well edited or proofed, and errors abound. The adventures provided are light and simple, but painfully railroaded. Any attempt to try something innovative will result is squishy gory death for the players. Hardly an ideal introduction into what role-playing games should be like. When a couple travelling along the English countryside stop to get directions from a pair of Ministry of Agriculture workers who are testing an experimental device designed to drive crop-damaging insects into killing each other, you know you're in for a good movie. While they plan their next stop, a man who has been dead for several days attacks--to be followed shortly thereafter by a full-scale zombie invasion--which could very well be a result of the agriculturist's distribution of ultrasonic radiation. A macabre, atmospheric Spanish-Italian co-production featuring extremely convincing performances and a haunting score by Giuliano Sorgini. The second half of the film contains enough gut-munching gore scenes to satisfy most horror fans, leading to an unexpected and eerie finale. Jorge Grau's film is a seminal entry in the Italian zombie genre and gained notoriety when it was banned as a 'video nasty' in the early 1980s. Thanks to our friends at Revolver Entertainment, we've got a copy of The Living Dead at Manchester Morgue to give away! 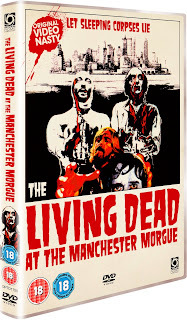 For your chance of winning it, send us an e-mail to manchestermorguegiveaway@yahoo.co.uk with your name and postal address before midday on Monday 8th June (UK time). The first three names drawn out of the electronic hat will win a free copy!